For island cooking convenience, you'll want to have utensils, spices, cookware, and oils stored under the counter in drawers or cabinets. Traditional counter height (36") is designed for standard counter stools, but if you want to use regular chairs, then part of the island will need to drop down to table height (29" to 30"). 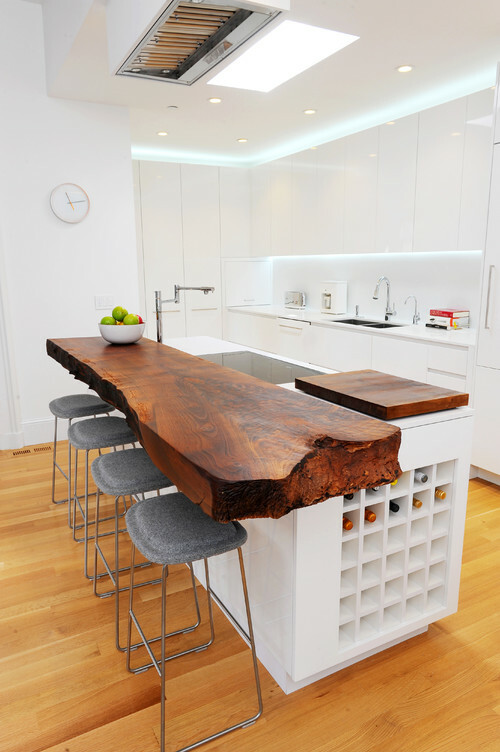 If you raise part of your island to 40" to 42", you'll need bar stools to accommodate the taller height. Move flatware and dishware closer to where families gather to eat. Drawers in the island are ideal for dinnerware storage. 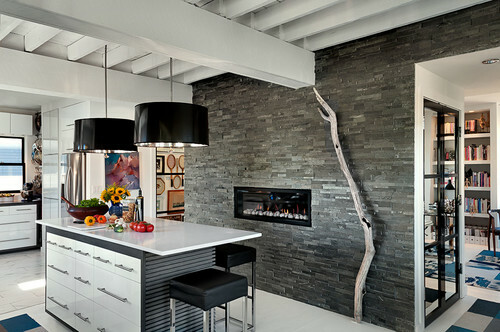 Consider "floating" your island countertop rather than supporting the island overhang with bulky legs or corbels. You'll have roomier seating as well as unobstructed access to storage below. Our Hidden Island Support Bracket is the perfect concealed support for countertop overhang for a kitchen island or breakfast bar. There is a plethora of a design details you can incorporate into your island design to create your own unique style. Here's a look a few of our favorites. 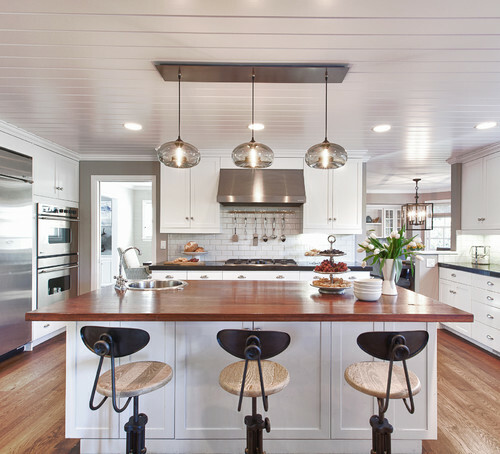 Whether you have a little cabinetry or a lot, consider an island with contrasting cabinetry to create interest. 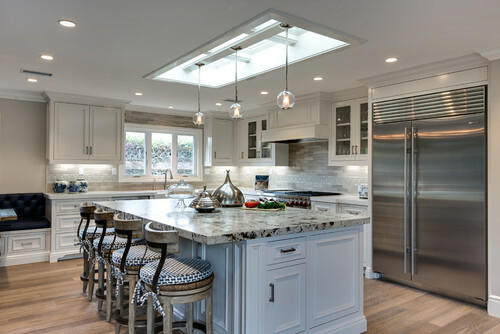 A contrasting island is an especially good move for the perennially popular all-white kitchen. 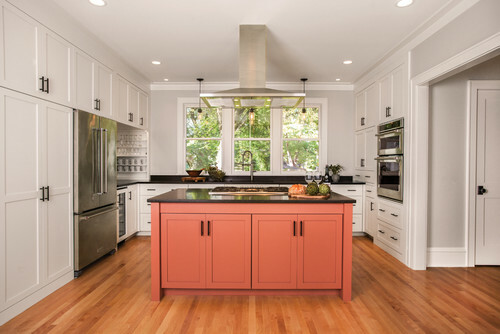 It's also a good option for those who like the idea of colored cabinetry but don't want the commitment that colored cabinetry throughout requires. 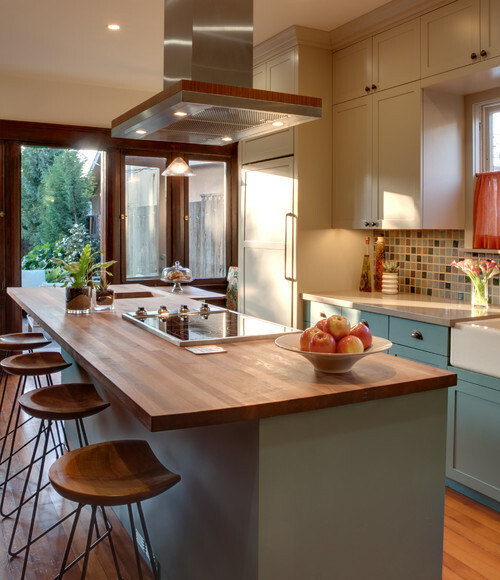 If you opt to stay with the classic look of uniform cabinetry, consider a different countertop for your island to create interest and help define the island as a focal point. Gone are the days kitchen cabinet hardware must match the other metals in the room (range hood, faucets, appliances, etc.) Copper, brass, gold, and silver can all be friends. A good rule-of-thumb is to use at least two metals, but no more than three. 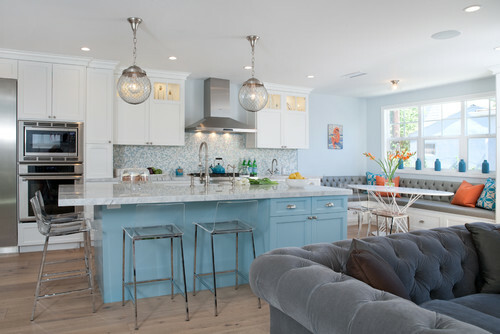 This kitchen island sports a silver faucet with brass drawer pulls and sparkly gold pendants above. If your sense of style is too broad to be defined by one aesthetic, mix and match your styles. A good rule-of-thumb for mixing and matching design styles is to follow the 80/20 rule: devote 80% of the space to the style you identify more closely with, and 20% to your secondary style. Whatever design details you choose for your functional and beautiful kitchen island, be assured that our U.S.A.-made, strong American Steel Island Support Brackets are up to the task. Protect your investment and create the on-trend look you desire with our range of support brackets to suit all types of kitchen island countertops. Questions? We're here for you to make sure you get the right brackets for your project. Connect with us today!